A skillful blend of romance and comedy, "Topkapi" shimmers with hilarity, action and great performances! Fun-filled and suspenseful, it's an incredibly ingenious affair and a considerable pleasure to watch. 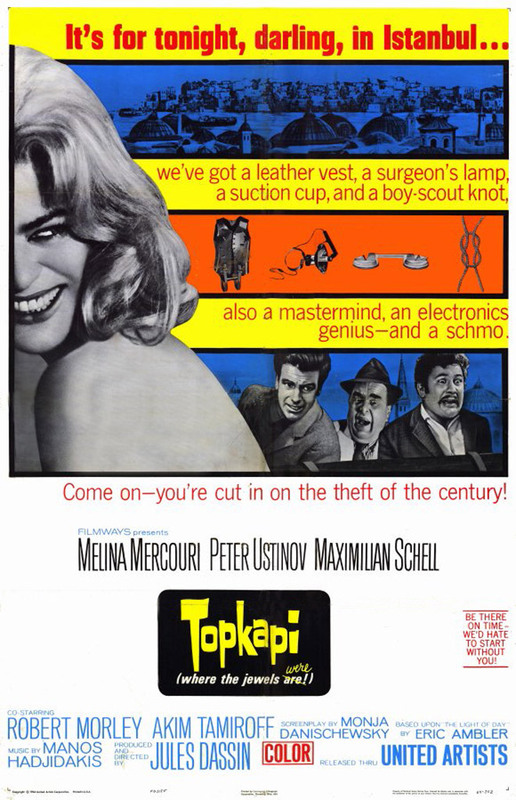 Trouble brews beneath the exotically curved towers of Istanbul when the equally exotic - and equally curved - Elizabeth Lipp (Melina Mercouri, "Never on Sunday") recruits her former lover (Maximilian Schell, "The Rose Garden") in a scheme to heist the pride of the city's Topkapi museum: a jewel-encrusted dagger. But the "job" soon turns into a high-tension, high wire act, when the bumbling fall guy (Peter Ustinov, "Appointment With Death") and other amateurs they've hired as help get more than they had bargained for. The stellar cast also includes Robert Morley ("The Road To Hong Kong") and Akim Tamiroff ("After the Fox"). Directed by great Jules Dassin ("He Who Must Die"). Peter Ustinov won the Academy Award® for Best Supporting Actor for his performance.